The Red Thread Between Nothingness And Eternity: Flash Writing and Found Music: Where's The Merry At? Don't ask me, Mack, I guess you'd better make your own. So I conjure up some scruffy, good-natured looking bums who all bear a strong resemblance to Humphrey Bogart. Eccentric, you bet...misunderstood, sure... but they've got scruples, man- and character, and they'll share a jug with you without you even having to ask. Me and Jimmy Stewart stand on the rail together looking down at the ice-choked river, seeing no other way out of our momentary troubles. But then cherubic angels whisper in our ears, and our hearts change, and then all the people of skid row look different to us - good and beautiful and kind - their hearts blossoming like flowers, and they take us in and make us feel instantly at home. Jimmy Cagney throws his heater in the drink and leaves behind crime and rage once and for all, and with a solitary tear, he puts out a bowl of milk for some half-frozen kittens and gives his coat to a forlorn old man who's eyes then soften and glow lovably. 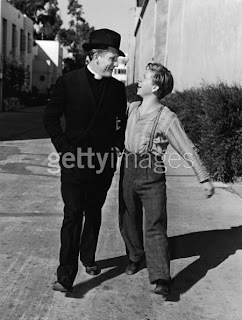 And look, there's Mickey Rooney as a kid and Spencer Tracey as Father Flannagan - they left a candle burning in the window for us - a symbol of their hopes and prayers for our safety, for our souls. "Gee whiz, we knew you'd come home! We just knew you'd come home!" they say, throwing their arms around me, the Jimmies, and Ol' Hump.